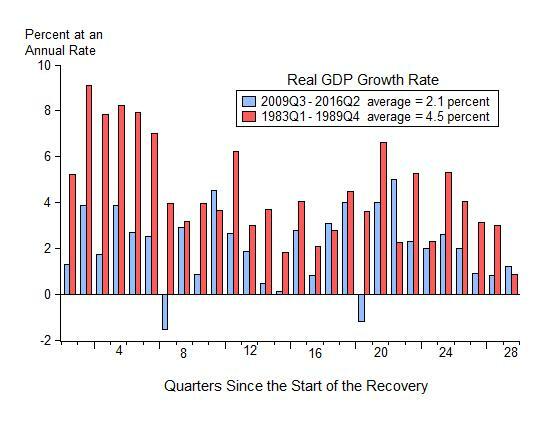 With today’s disappointing GDP release for the second quarter and downward revisions for the previous two quarters, the U.S. economy completes 7 years of economic expansion with a whimper. And with an average annual growth rate of only 2.1 percent over the 28 quarters from 2009Q3 to 2016Q2, the economic expansion is more aptly called economic exasperation. I have been pointing to poor government economic policy as the main reason for this poor performance from the start, explaining the defects with each alternative explanation as it has arisen over time, including “it’s not so weak” and then “weak recoveries just happen after deep recessions” and then “it’s just secular stagnation.” People’s exasperation about the economy and Washington policy is seen in this presidential election season. The slow economic recovery is a tragedy for many people, especially when you combine it with the great recession that went before it. Policy must change. You would think that reports of three more quarters of disappointing growth would spur people into action. and an updated list of links to posts on this subject on EconomicsOne.com which also include pro-growth policy reforms.